Having 3D printed the shell for an EMD DD35 I now have to alter the chassis of a Bachmann DD40AX so that the shell will fit onto it and give me a working locomotive. Actually, I can’t take the credit for the all the work done on this one, much was done by another modeller, Bob Norris, and the photos are courtesy of him. The Bachmann chassis is 24mm too long so the next problem is where to cut to shorten the chassis. 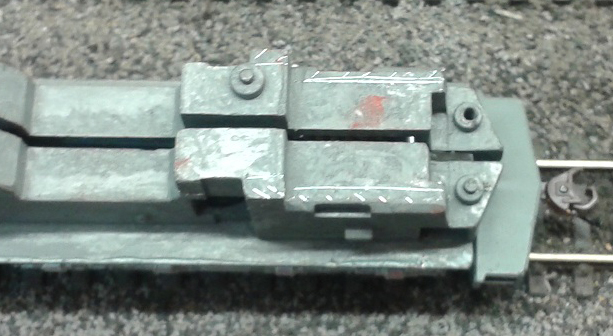 We can’t lose length on either end because of the drive mechanism, but on the Bachmann chassis there are two motors, one next to each mechanism, so the only room left is in the middle of the chassis, between those motors. Each motor has an extra flywheel which fills this section but these can be removed, which would clear a space on the chassis of about 28mm. Before you start shouting at the screen that taking 2 of the 4 flywheels out will make it less smooth, it didn’t. This is a cabless booster, it will be coupled to another loco, which will overcome any issues. So with that, let’s cut out 24mm. You can see the recess where the old fly wheels were. We marked the center of the chassis with the areas of metal to be removed. We also had to remove some material from the cab end, as the DD40AX was wider at this point and needs to be thinned to the same width as the shell body which will be dropped on top. Once the loco had been cut and re-assembled it was wired up for simple DC control, just to test, and it ran like a dream. The joint between the two chassis halves was split with a plastic strip to separate the frame electrically. In the DD40AX configuration the left and right sides of the chassis are separated by plastic washers which leave a gap of about 2mm. To maintain the strength of the shortened chassis a plastic strip was added that filled this gap and bridged the joint. All the other faces where joined in a similar fashion, all glued together. The view from the underside between the fuel tank mounts. Here you can see the cut down area where the cab was. We also cut down the top of this area to make room for the DCC chip, as there’s no longer space where it used to sit. And here it is with the DCC decoder reinstalled. The split front and back sections of the frame have also been joined by wires so as not to rely on the butted joint between the two halves. This is how the shortened DD40AX chassis looks next to an unmodified original. As you can see from the image above, there’s a lot taken out from the chassis. The result is the chassis for a working model of a DD35 locomotive, which is great as you can’t buy these anywhere else. All in all I think a fantastic job, with thanks to Bob Norris. If you have any questions about shortening your own chassis to fit into your EMD DD35 locomotive shell please feel free to get in contact. Next post will cover finishing the model.